About to appear in SSB interview and looking for common mistakes done by candidates during SSB interviews? Check out mistakes repeated by most candidates which becomes a reason for their rejection from SSB interview. 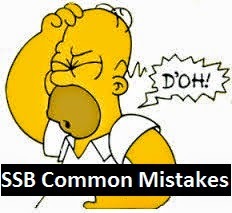 Let us check out what are the most commonly done mistakes by candidates in SSB interviews. SSB interview is the most difficult exam for many candidates. Many candidates who are rejected by selection boards even don't know why they were not recommended. Knowingly or unknowingly, many candidates do commit lots of mistakes during five day SSB interview which are listed below. First in our list of most common mistakes in SSB interviews is casual attitude. Many candidates take SSB interview very casually. As it is said that chances of getting recommended depends purely on candidate's luck by most of experienced candidates, many aspirants appear for SSB interview with a casual attitude. If you are in a mind set of I don't care, then definitely you may not succeed. As the interview is for selection of grade I officers, one must be careful not to take the interview casually. So if you are about to appear in SSB interview, be little serious about the interview and behave accordingly. Second in our common mistakes list of SSB interview is worrying. Many candidates are very worried about the coming test during SSB interview. This is quite common for the candidates who are appearing for the first time. Just leave the worry about the next exam. Candidates will be briefed well in advance about the SSB interview test before it begins and also there will be good amount of time to clear any doubts. Excess of worrying during SSB interview will not help you in any way but it lessens your efficiency and thus have a negative impact on your performance. So just don't worry about the tests. Just participate in the events you are asked to participate with 100 percent dedication. Over-reacting is also one of the common mistakes done by candidates in SSB interviews. Many candidates think that if they show their activeness, they will get selected. In the process of showing activeness, candidates tend to over-react for each and every thing. Candidates show aggression and unnecessary temperament. So be cautious that showing over aggression will definitely can become a reason of rejection from SSB interview. Poor communication skills is also a reason of rejection in SSB interviews. Though many candidates could not certainly judge that they have poor communication skills, it is the most common mistake of candidates in SSB interviews. Fluency in speech is very essential to get recommended by the selection board. So try to improve communication skills. So we have seen common mistakes done during SSB interviews here.